If you have ever seen a photo booth and video booth in use, you will know how popular, enjoyable and sometimes even addictive they can be for your guests. It is becoming another form of entertainment for your guests, and also a fun way to capture the mood and memories of your special day. If you haven’t seen one before rest assured a Yorkshire Booth Brothers photo booth for your event will add something really special to the occasion that can be cherished for years to come. Weddings and other events, Yorkshire Booth Brothers can also supply guest books for your guests to share their messages as well as cherished moment. They can also leave video messages, which we will supply on a USB stick. Yorkshire Booth Brothers software will also allow you the option to have all the photos and videos from your booth posted on your own private area of our website and giving you the option to post them on your Facebook page. Your Yorkshire Booth Brothers photo booth will also come with a range of props such masks, hats, boa’s, wigs etc and will also have our NEW and unique facial recognition option for a larger range of fun digital props, so you can add wigs without ruining your hair style! Do you want to add something different, special and unique to your corporate event? Whether it’s an awards ceremony, staff conference, product launch, marketing event or just your work Christmas party, a Yorkshire Booth Brothers corporate photo booth hire will add a little fun into the event. A Yorkshire Booth Brothers corporate photo booth hire will provide you with a great way to entertain, whilst also assisting with your business’s marketing. You can also make the most of social network sharing and marketing with our unique “post to facebook” option in our bespoke photo booth software that comes as part of your hire package. We can provide a corporate photo booth which will not only entertain those attending your event but also can be fully customised as a branded photo booth, to match your brand colours and style or theme for the occasion. 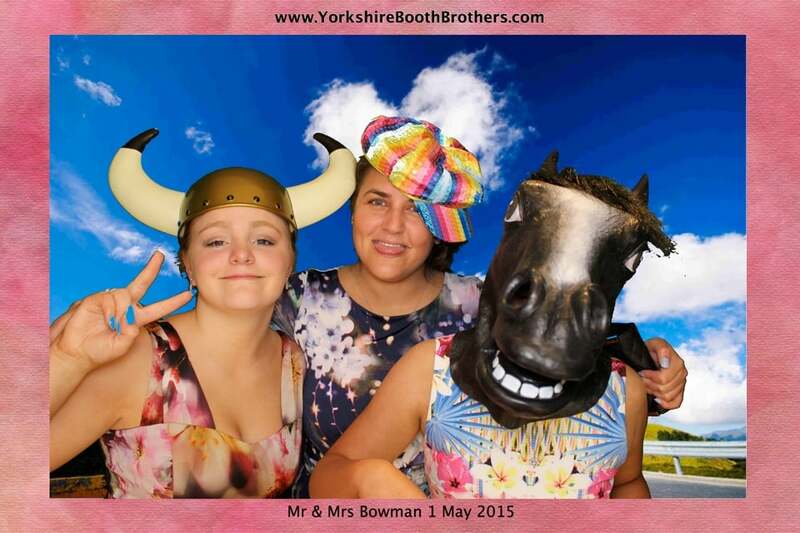 Every promotional photo booth from Yorkshire Booth Brothers , comes with a high quality DSLR camera and the latest in photo image printing technology to ensure the very best quality prints every time for you and also your guests. If you want a special message printed on your prints this can also be done, at no extra cost. In fact we will go the extra mile to ensure your promotional photo booth hire is a complete and memorable success.